Let's be honest, this story isn't that complicated. 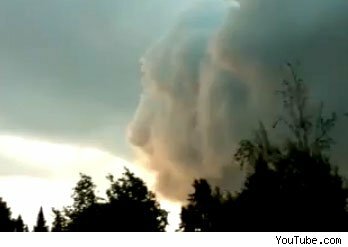 There's this cloud, right, and if you look at this cloud, it looks like it's actually a face coming down from up above. We wish we could inform you of some kind of Green Lantern-style alien race coming to earth in the form of cumuli fracti, or Skittles hailing down from the sky, but this is what we've got – and if we're honest, it's a pretty impressive spot.